Arab Fans Attack May Hariri for Wearing a Hijab! Lebanese actress May Hariri maneuvered into the spotlight today by wearing a hijab. 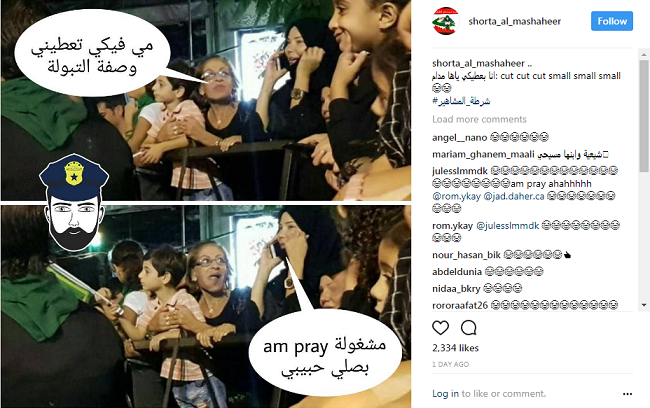 The Instagram account shorta_al_mashaheer ("The Celebrity Police") posted a comic of the actress in black hijab standing next to a rather enticed woman. "May?" says the enticed woman. "Could you give me the tabbouleh recipe?" "I am busy," says May. "Am pray [sic]." Anyway, people were angry that Hariri was wearing a hijab, because she seemed to do it...for reasons not to do with religion. God knows. Arab celebrity fans could drive a butler insane.